The exhibit “Printing the Past: SC in 3D” will have its grand opening at the Horry County Museum on Tuesday, April 30, 2019 from 3-5 pm. 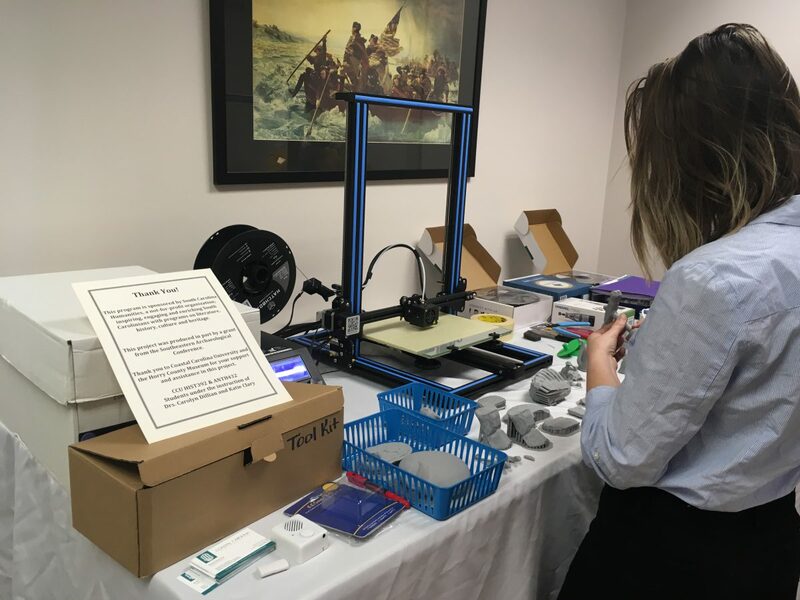 The exhibit features 3D scanned and printed artifacts in a hands-on display spanning Horry County’s prehistory and history, with audio and braille interpretation for all audiences. SC Humanities supported this program with a Mini Grant. For individuals with visual impairments or sensory disabilities, displays are often inaccessible – housed in glass display cases and interpreted via signage. This project fosters inclusivity in the humanities, as visitors both with and without visual/sensory disabilities will have the opportunity to touch and learn about South Carolina’s unique past. The exhibit “Printing the Past: SC in 3D” will focus on the history, culture, and archaeology of Horry County, South Carolina, with specific goals of preserving and promoting knowledge and understanding of the past and present culture of the region. Artifacts that will be scanned fall into three main humanities categories: Native American prehistory and history of the Waccamaw Indian People, military history of the region, and personal and cultural items (toys, health, etc.). For example, Native American artifacts are currently in glass cases with text display panels. For this project, an assortment of pottery (with varying surface treatments that may be of tactile interest), projectile points, a decorated pipe, and a groundstone have been selected for scanning/printing. The exhibit was created by Coastal Carolina University students working with Assistant Professor M. Katie Clary, Department of History, and Professor Carolyn Dillian, Department of Anthropology and Geography. The exhibit was produced in part by a grant from the Southeastern Archaeological Conference. For more information about the exhibit, contact Carolyn Dillian at Coastal Carolina University at 843-349-2777. The Horry County Museum is located at 805 Main Street, Conway, SC 29526.